HMAS Balikpapan was named after the final, and largest amphibious landing of the Pacific War involving Australians when the Royal Australian Navy’s (RAN) amphibious squadron comprising HMA Ships Manoora (I), Westralia (I) and Kanimbla (I), put RAN Beach Commandos and troops of the Australian 7th Division ashore at Balikpapan in Borneo on 1 July 1945. Balikpapan was the prototype of six Landing Craft Heavy (LCH) vessels which later formed the RAN’s first dedicated Landing Craft Squadron. She was originally commissioned on 8 December 1971 as an Australian Army vessel operated by the Water Transport Squadron. She transferred to the RAN in Brisbane on 27 September 1974. While she was the first of the LCHs to be launched, she was the last to be commissioned into the RAN. HMAS Balikpapan was one of eight Balikpapan Class vessels operated by the Royal Australian Navy. The LCHs were capable of moving large amounts of cargo, personnel and equipment from larger ships to shore and vice versa. A very shallow draft allowed them to access otherwise unreachable areas. A typical army equipment lift would comprise three battle tanks, 23 quarter ton trucks or thirteen armoured personnel carriers. Balikpapan underwent a major refit before commissioning in the RAN and was almost immediately called upon to offer humanitarian relief as part of Operation NAVY HELP DARWIN, the RAN’s assistance mission to Darwin in the wake of Cyclone Tracy which devastated the Northern Territory’s capital city on Christmas Day, 1974. The ship’s company was recalled at 20:00 hours on Christmas Day although many members had by then already reported for duty on their own initiative. Balikpapan, along with her sister ship, HMAS Betano, were the first RAN vessels to depart for Darwin on Boxing Day. 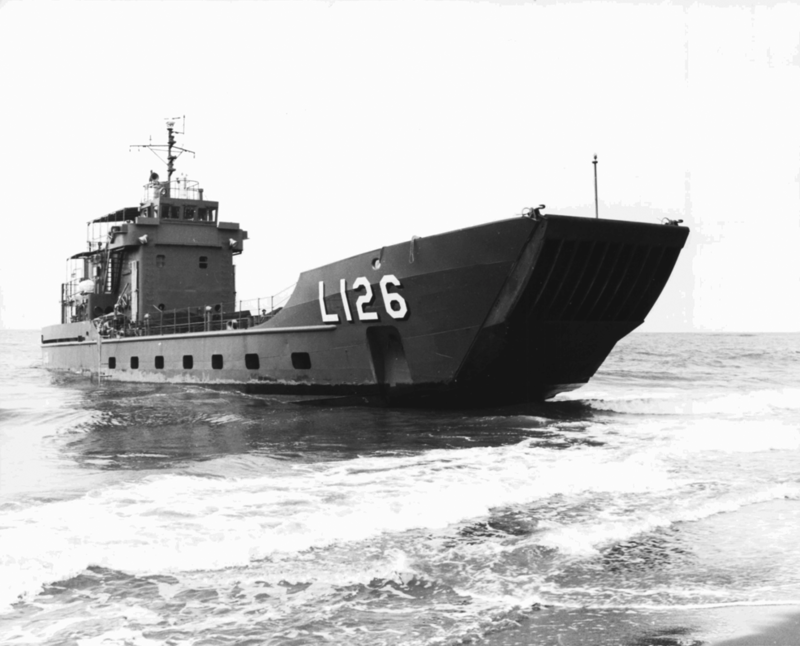 The two LCHs arrived in Darwin on 4 January 1975 carrying food and other supplies, and spent the next three days assisting in clean up operations. 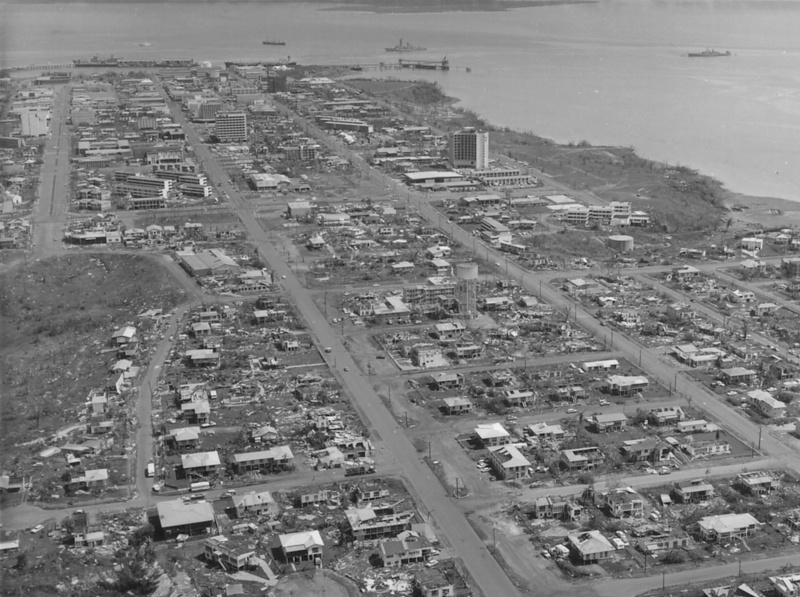 An aerial view of the devastation wrought on Darwin by Cyclone Tracy. Following the deployment to Darwin, Balikpapan settled into a routine of exercises and training off the east coast of Australia, participating in beach assault exercises with units from both Australia and the United States. She departed for her first overseas deployment on 1 April 1975 spending three months in Asian waters exercising with various foreign navies and making her first port visit to Balikpapan between 8-10 June 1975. She returned to Australia on 17 June continuing the routine of training, exercises, maintenance and various other support tasks for the remainder of the 1970s. This included a six week deployment to the Northern Territory for Exercise LONG VIGIL, a very successful period of joint-service amphibious exercises. In March 1978, Balikpapan departed for her second overseas deployment for which geological and mapping teams were embarked for participation in Operation CENDERAWASIH in Irian Jaya. She returned to Australia in late April. She also participated in the first of a series of major cross service surveying operations known as Operation BEACHCOMBER, the aim of which was to gather information on the beaches and hinterland of Australia’s northern coastline between Brisbane and Geraldton. Left: Balikpapan moves away from the stern door of USS Point Defiance during Exercise Kangaroo. Right: An APC waiting for Balikpapan to run up the beach at Amity Point, January 1981. The high tempo of exercising continued into the new decade involving participation in Exercise KANGAROO in 1981 and 1983, and a three month deployment to Western Australia from August 1982 as part of the ongoing BEACHCOMBER series of operations. Balikpapan maintained close links with the army throughout the 1980s embarking students from the Army School of Transport’s Maritime Wing in addition to her regular trainees. On 23 September 1985, Balikpapan was temporarily decommissioned and placed in a state of reserve at Cairns. She remained in reserve until mid-1989, when it was decided that she would be reactivated as a training vessel for the Darwin Port Division of the RAN Reserve. A reactivation refit began in November and completed in February 1990 after which Balikpapan departed Cairns for Darwin. She officially recommissioned on 24 February in Darwin. Balikpapan greatly expanded the Darwin Port Division’s training capabilities, particularly in navigation training and engineering. Her commitments were much the same as her first commission in terms of training, exercises and support tasks, including participation in major Fleet and cross service exercises such as KANGAROO 92 and SQUADEX 93, the only difference being that she had a predominantly RAN Reserve crew drawn from all parts of the country. Balikpapan’s period as a RAN Reserve vessel came to an end in August 1993 at which time a permanent naval crew was assigned to her. She quickly resumed the high tempo of training and exercises typical for LCHs including regular participation in annual Navy, Army and joint-service exercises such as; SQUADEX, PROWLER, NOMADIC WARRIOR, FLASHING SABRE, SWIFT EAGLE, KANGAROO and Fleet Concentration Periods. She also renewed her participation in Operation BEACHCOMBER as well as performing various support tasks such as support for the NORFORCE Patrol Commanders' Course. Balikpapan was among the first RAN LCHs to apprehend an illegal foreign fishing vessel when it apprehended two vessels in the vicinity of the Buccaneer Archipelago on 17 November 1994. Both vessels were handed over to West Australian Fisheries Officers the following day and successfully prosecuted a few days later. 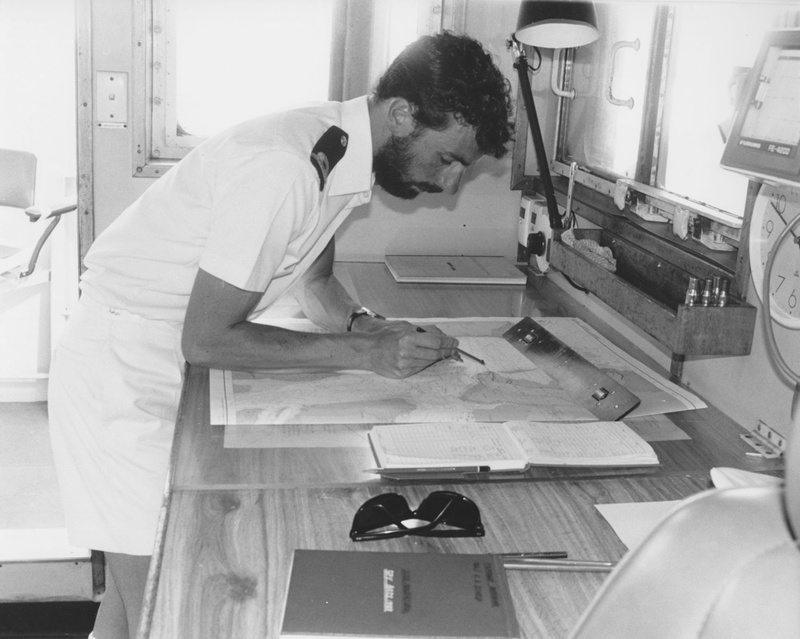 Navigator Sub Lieutenant Rohan Schied plots Balikpapan's position as she approaches Darwin. In May and June 1996, Balikpapan participated in Exercise NORTHERN ENDEAVOUR 96 providing health assistance to the indigenous communities of the Tiwi Islands. She made a number of supply trips between Darwin and Nguiu on Bathurst Island as well as conducting logistics planning with NORTHERN ENDEAVOUR operations staff. Similar activities were carried out in May and September 1998 when support was provided to the Army ATSIC Community Aid Project on Groote Eylandt, a project which Balikpapan supported periodically for more than a decade. 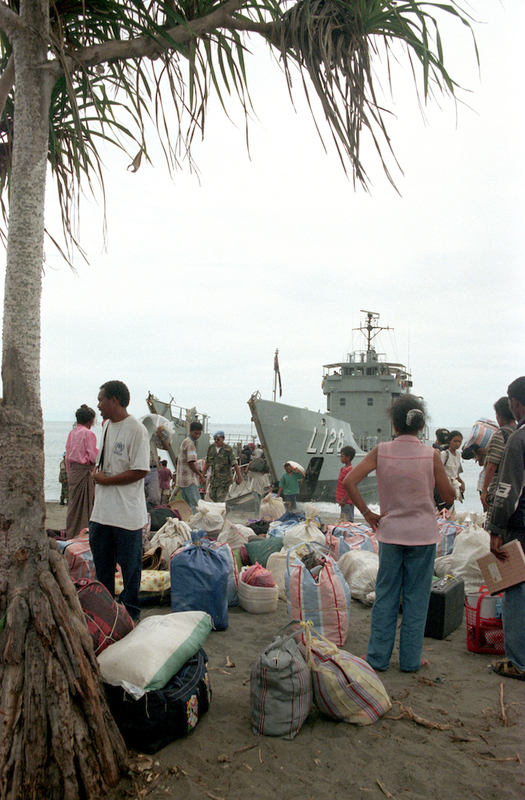 Internally Displaced People returning to Anzac Bay, Suai on HMAS Balikpapan, November 1999. 1996 proved to be a very successful operational year for Balikpapan and the crew’s exceptional performance was recognised when the ship received both the Maritime Command Amphibious Force Element Group Efficiency Award (for the second time) and the LCH Proficiency Award (for the third time), the first time that both awards had been presented to the same unit in one year. In March 1997, Balikpapan departed for her first overseas deployment since re-commissioning to participate in Exercise FLYING FISH 97. The deployment included visits to ports in Indonesia (including a port visit to Balikpapan from 9-13 May), Singapore (where Clearance Diving Team One was embarked for the exercise) and Malaysia. She arrived back in Darwin on 22 May and later underwent a refit. While the deployment for Operation FLYING FISH was Balikpapan’s first overseas deployment for nearly two decades, it marked a shift in focus for the LCH as overseas operational deployments became more frequent over the next few years. In January 1998, Balikpapan deployed to Bougainville Island and Papua New Guinea for Operation BELISI, providing sea lift and other logistic support to HMAS Tobruk and the Multi-National Truce Monitoring Group on Bougainville. It became the first in a number of deployments to Bougainville with the ship supporting Operation BELISI II between June-August 1998, November-December 1998, July-September 2002, November 2002-January 2003 and May-June 2003. This last deployment was preceded by a stop at Choiseul Island in the Solomon Islands to deliver medical supplies on behalf of the Catholic Mission Australia. She was also briefly deployed to Papua New Guinea in April 1998 to retrieve Army vehicles used in famine relief efforts. 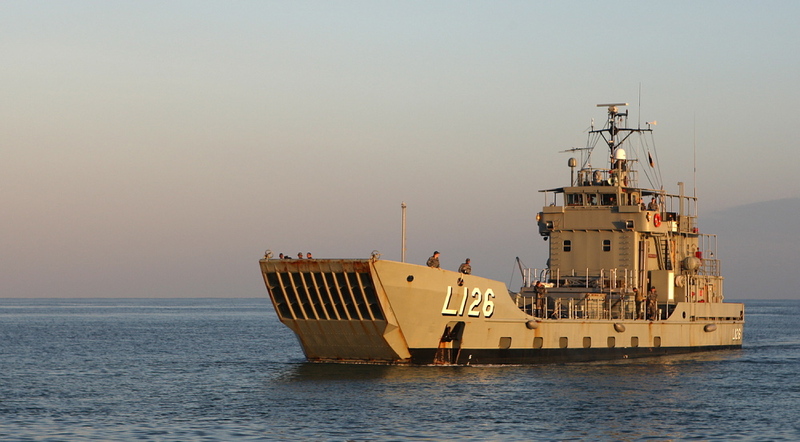 Balikpapan was one of several LCHs deployed to Dili on 18 September 1999 in support of Operation STABILISE. She returned to Darwin on 12 November for maintenance and deployed again on 8 December, spending the New Year in Dili Harbour. She departed Dili on 14 January 2000 ending a hectic 90 days spent in the area of operations over two deployments. Upon returning, Balikpapan underwent a Life of Type Extension (LOTE) which kept the ship docked in Cairns from January until September 2000. Upon completion of her LOTE she again deployed for East Timor in November-December in support of Operation TANAGER. She deployed three more times in support of Operation TANAGER in 2001; in February-March, May-June and July-August. She was also briefly deployed to Noumea for a goodwill visit in April-May 2002. In August 2003, Balikpapan departed Australian waters again for the first of two deployments in support of Operation ANODE, the Australian Defence Force’s contribution to the Government’s strengthened assistance program to the Solomon Islands. Balikpapan provided sea-lift support for the Regional Assistance Mission Solomon Islands (RAMSI) forces scattered throughout the various islands located in the area of operations. She returned to Australia in October 2003 and redeployed in January-February 2004. Bosuns onboard HMAS Tobruk make ready for a stern door marriage with HMAS Balikpapan, off the coast of Dili, East Timor, during Operation ASTUTE. Balikpapan returned to Dili in May-June 2005 in support of Operation SPIRE. She made a number of further deployments to the East Timorese capital providing sea-lift support for Operation ASTUTE in May and June 2006, September-October 2009, February and May 2010. A further trip to Dili was undertaken in November. Balikpapan’s stays in Dili normally lasted between one and two days with a hectic period of unloading and loading supplies and equipment before making the return voyage to Darwin. 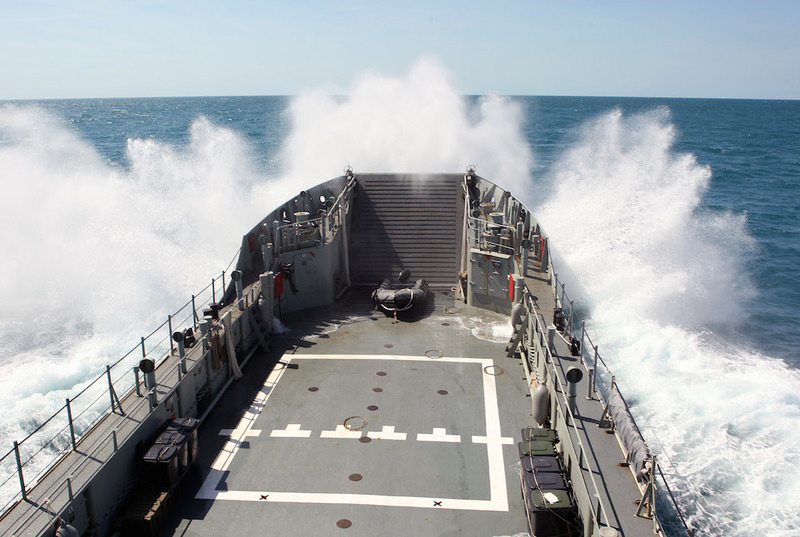 HMAS Balikpapan makes her way through heavy swell off the coast of Darwin during the Minor War Vessel Concentration Period 2010. In addition to her regular overseas deployments in the 2000s, Balikpapan’s operational commitments in Australian waters also increased. She supported RAN NORFORCE Operations in October and November 2005, December 2006 and throughout 2007. She also participated in Operation OUTREACH delivering much needed supplies to remote Indigenous communities in the Northern Territory in October and November 2007, and April 2008, while maintaining regular participation in important annual exercises such as SQUADEX, SEALION and TALISMAN SABRE as well as support tasks for Operation RESOLUTE. Left: Able Seaman Dental Assistant Vanessa Gamble with Timorese children during the Timor-Leste phase of PACIFIC PARTNERSHIP 2011. Right: Jodie, a child living at Haus Clare Crisis Centre for Children, performs a dental check on Able Seaman Dental Assistant Melissa Lavelle during PACIFIC PARTNERSHIP 2011 in Lae, Papua New Guinea. Balikpapan returned to Dili in March 2011 in support of Operation ASTUTE before making preparations to deploy to Vanuatu and East Timor in support of the US-led humanitarian assistance mission PACIFIC PARTNERSHIP 2011. Balikpapan and her sister ship, HMAS Betano, provided sea lift support for Medical Civic Action Program and Veterinary Civic Action Program teams in May and June, primarily around Luganville, Tangoa Island and Big Bay in Vanuatu, and Oecussi and Lautem in East Timor. The two ships played a vital part in PACIFIC PARTNERSHIP 2011 providing the capability to move and sustain large medical and veterinary teams in remote locations. Left: HMA Ships Balikpapan, Benalla and Pirie enter Darwin Harbour in formation on completion of Exercise TRITON THUNDER 2012. Right: Able Seaman Clayton Marshall fires the 12.7mm Browning Machine Gun onboard HMAS Balikpapan during Exercise TRITON THUNDER 2012. HMAS Balikpapan, along with her sister ship HMAS Betano, decommissioned in Darwin on 12 December 2012, bringing to an end nearly four decades of essential logistic support not only to the Australian Defence Force, but also to the broader civilian communities of Australia and the South Pacific, the high tempo of her commitments reflecting the ship’s motto ‘Bravely in Action’. 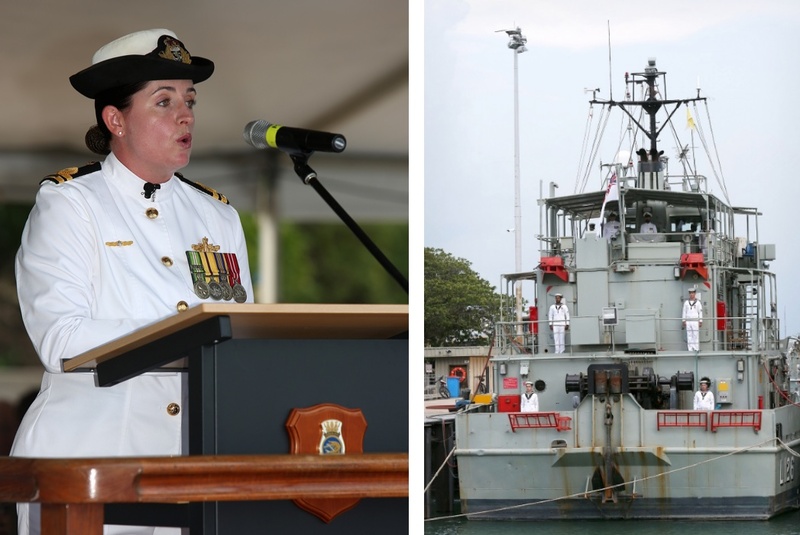 Left: Commanding Officer of HMAS Balikpapan, Lieutenant Justine Archer, RAN addresses dignitaries, crew, family and friends at the decommissioning ceremony. Right: Crew members onboard HMAS Balikpapan for the last time during her decommissioning ceremony. Between February 1990 and July 1993, Balikpapan served as a training vessel for the Darwin Port Division of the RANR, during which time numerous RANR officers had the honour to act as her commanding officer for short periods.